Our new 75m² summer house Björkebo is located less than 220m from the pikeperch (zander) lake Stora Nätaren. 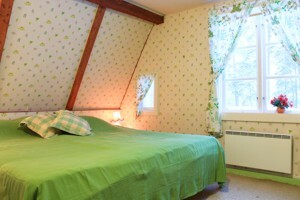 The 2 bedrooms of the cottage house enough room for up to 4 adults and 1 child. There are no other houses between the cottage and the lake so even though the distance is 220m you can see the lake directly from the cottage. Only elks passing by or grazing cows could come in your way when heading down to the lake. About 300m from the cottage there is also a swimming spot with a small beach. In other words this cottage is perfect for a lakeside family holiday in Sweden. 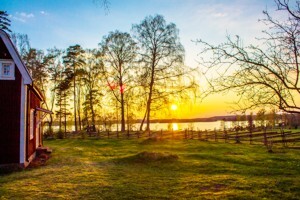 While the children are playing at the beach, the other guests could go fishing, enjoy reading a book or start preparing the barbecue for the dinner. The cottage is just beside the farm of Annalena & Jens - the owners of the House Björkebo. 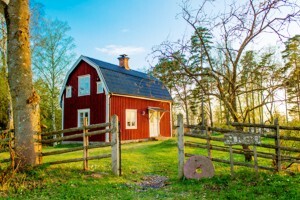 So if you spend your holiday here you're not only renting a lakeside cottage in Sweden, you also get the chance to experience a holiday on a real Swedish farm surrounded by green fields and forests. As shown in the picture to the left, the House Björkebo offers fantastic views over the pikeperch (zander) lake Stora Nätaren. If you rent a boat from us you will find it down by the lake at the boathouse. 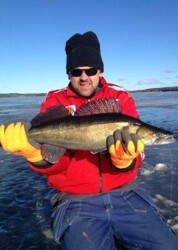 Fishing fans can download the depth chart over lake Stora Nätaren here. It's rather unusual for a lakeside cottage in Sweden to have a sandy beach, but you'll find one 300m from our cottage Björkebo. 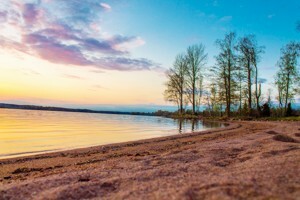 One advantage with the beach, shown on the photo to the left, is that is makes it easier for families with young children to go swimming in the lake while spending their holiday in our House Björkebo in Sweden. The lake Stora Nätaren, located only 220m from the cottage, is considered one of the best pikeperch lakes in Sweden. We can supply you with the necessary fishing permit and you can choose among different boats to rent from us or even hire a local fishing guide if you wish. 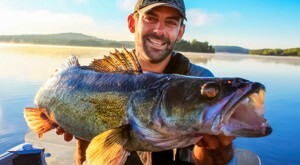 A depth chart for the pikeperch lake Stora Nätaren can be downloaded here. Downstairs in our cottage at Stora Nätaren is the living room with a fireplace, a bathroom with shower & toilet and the kitchen with a dining table for 3 people. If the table is too small you can extend it in the living room or even bring it outside the cottage. 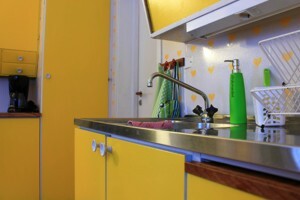 In this lakeside cottage in Sweden you'll find everything you might need when cooking: refrigerator & freezer, stove with 4 stove plates, oven, microwave, kettle, coffee machine, toaster, cutlery, china, pots, pans, glasses and bowls. All this is complemented by a barbecue spot beside the cottage - all you have to bring is the barbecue coal. By going up the small stairs from the hallway you end up in the first charmingly decorated bedroom with a big and comfortable double bed for 2 people, which can also be converted into 2 single beds. On one side of the room there is another small single bed. Since this is close to the stairs we don't recommend it being used by the youngest children. Through a small door the "green" bedroom upstairs is connected to the second and somewhat bigger bedroom of the cottage at lake Stora Nätaren. The comfortable double bed guarantees you restful nights and mornings on your holiday and the many charming details of the room help create a cozy atmosphere. If you'd like a baby bed please ask us in advance and we will provide it for you. To be able to explore the Swedish nature around our cottage at lake Stora Nätaren we are happy to lend you 4 bikes if requested (1x28" man's bike, 1x28" woman's bike, 1x26" bike und 1x24" children's bike). Please don't forget to bring helmets for children since this is regulated by law in Sweden. 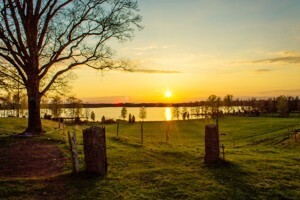 From the seating area with the barbecue right in front of our lakeside cottage in Sweden you have fantastic views, especially over the lake Stora Nätaren - especially popular for pikeperch fishing. 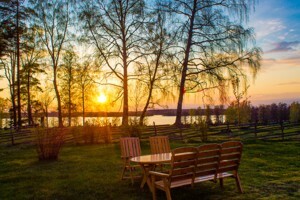 Every evening you can enjoy the pleasure of watching the sunset over the lake, like in the photo to the left, while you are preparing your freshly caught fish for the barbecue. 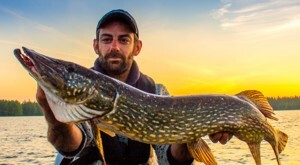 Whether a beginner or experienced with pikeperch fishing - our local fishing guide Henrik Olsson increases your chances of a getting a big pikeperch, pike, perch or char, adjusting the experience to your knowledge and wishes. Aboard Henrik's well-equipped boat you'll have everything needed including fishing gear, echo sounding device, and coffee. The days marked in red in the booking calendar are already booked by someone else. Please choose one of the vacant periods. If our cottage Björkebo should already be booked please see if our other fishing cottage at Stora Nätaren is still available during your requested period or take a look at the booking calendar for our other lakeside cottages in Sweden or our seaside cottage in Stockholm. Prices apply in Swedish Crowns (SEK) for one full week from Saturday to Saturday. Higher prices may apply to stays shorter than one week and arrivals or departures on days other than Saturday. There are NO HIDDEN COSTS! A row boat, water and 200kWh of electricity are included in the weekly rent. Please bring your own bed sheets and towels and clean the cottage yourself before your departure. The prices given in EUR are quoted from Yahoo Finance and are only made available for your orientation. We take no responsibility for the rate used and the accuracy of the EUR prices. Currently you get about 0,10 SEK for 1 EUR. 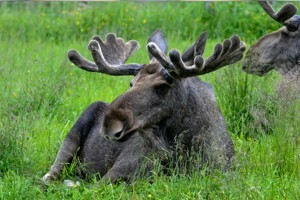 Not only our guests enjoy life at Björkebo, in particular the elks do too. Especially during late April and during all of May we regularly get visits from elks. Whoever wishes to see elks in their natural habitat has come to the right place. Just tell the landlords Annalena & Jens this at your arrival and they'll be happy to let you know when an elk is passing through close to Björkebo. Arrival on Saturdays after 3 pm. Departure by agreement but at the latest on Saturdays 10 or 12 am. Pets are not permitted in this cottage. Please take a look at one of our cottages suitable for a holiday with your dog! Other periods, arrival & departure days or times are only possible on request. Bed sheets can be rented on request, but please bring your own towels. Smoking is not permitted in our House Björkebo! You can still smoke outside the cottage, but we kindly ask you to gather the cigarette butts in an ash tray..